Players of video slot games are after the money during the jackpot and bonus rounds – and this is true for players of Scoop the Cash. 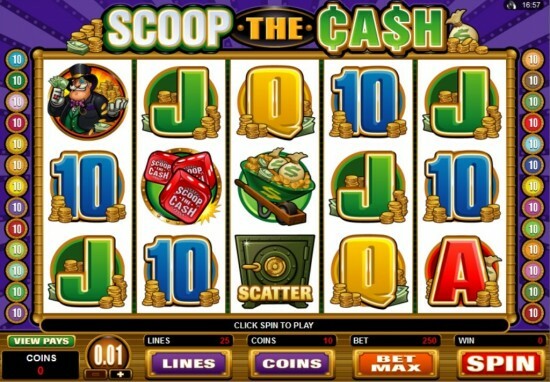 Developed by Microgaming, Scoop the Cash is a wealth-themed video slot game that high and low rollers both love to play. The symbols used in the game are the status symbols for modern-day wealth. Players can enjoy the game in several online casinos with varying bonus amounts. These include Platinum Play ($1,500), 7 Sultans ($1,000), and Royal Vegas ($1,200), among others. One of the strengths of Microgaming software is the highly satisfactory, if not excellent, animation quality for its games – and Scoop the Cash is no exception. The symbols are drawn with high attention to detail, thus, resulting in sharp and vivid graphics, which capture players’ attention even from among several slot games. These also become animated when winning combinations are made. The sound is just as excellent. The background music has a lively feel to it, which increases when winning combos are made, as well as synchronizes with the animation. Players can manipulate all three betting options, namely, the coin denomination, number of coins per payline, and number of paylines. The coin size range is 0.01, 0.02, 0.05, 0.10 and 0.20 while the paylines are 25 total. The total bet then ranges from $0.01 to $50.00 – truly, a good range for low rollers but perhaps not so for high rollers. Each of the 25 paylines can be adjusted by operating the +/- buttons on the screen. The Bet Max button can be activated to select the maximum allowable amount of coins for any chosen size in all paylines. • Bonus round occurs when the Dice symbol simultaneously appears on reels 2, 3 and 4 but only when all 25 paylines are enabled. Lucky players are given 2-4 rolls in a set of three dice. Winning in the bonus round is possible in three ways, namely: first, getting a sum of each dice roll according to the payout table; second, totals rolled are of the same color with payouts of 20 times the total wager; and third, roll all three of a kind with payouts of 100 times the total wager. • Free spins bonus round is triggered when three scatter symbols (safe) appear in any order on the reels. Three scatter symbols equal 10 free spins plus a bonus 5 times the total wager, for example. Both the bonus round and the additional free spins may be retriggered although only during the free spins. • Fixed jackpot of 5,000 coins when 5 symbols appear on an enabled payline. If 5 wild symbols appear in any position, the payout is 250 times the total wager. The second jackpot has a 1,500-coin payout. Since there is no progressive jackpot and the wild symbol is not a multiplier, high rollers may think twice about playing the game.